If you love spinach artichoke dip, this is the pasta for you It's your favorite appetizer made into dinner! I've been working really hard over the past couple of weeks to stretch out and try new dinner recipes. When I saw this on Pinterest, it flew straight to the top of my must-make list! My husband and I both ADORE spinach artichoke dip. When I'm at a party and someone shows up with a hot and cheesy spinach artichoke chip, you can pretty much count on find me hovering over the bowl for the remainder of the event. My dignity cast aside, clearly. 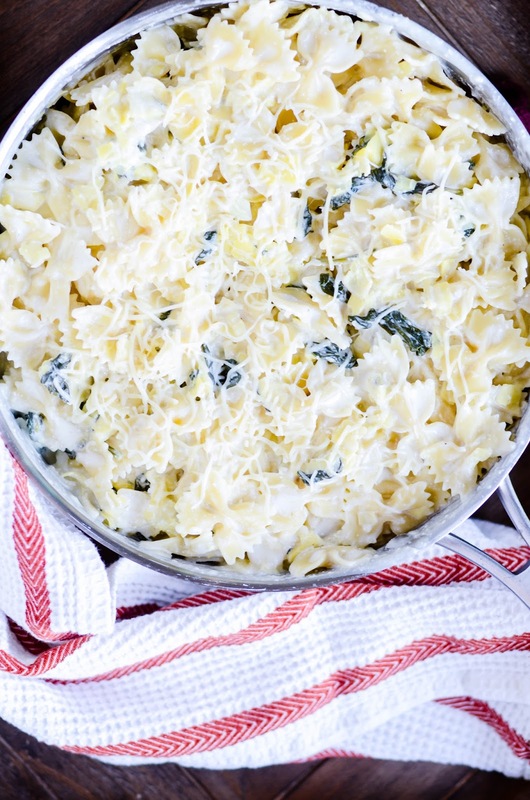 Spinach artichoke dip in an acceptable family meal form? Yes, please! Sign me up! And the BEST part of this meal? My picky 7-year old ate it. She asked me, "do I like artichokes?" I shrugged answered nonchalantly, "probably." You gotta play it cool in these situations, you know? They can sniff out your hope that they'll eat the meal in a hot minute, and then it's game over. So I was cool 😎. One bite later, she's all "Oh, I guess I do like artichokes. It kind of taste like pasta." Boil and drain the pasta. Set aside. Chop the artichoke hearts into small pieces, and set aside. Add the cream cheese, sour cream, and white wine to a large skillet over medium heat. Stir until cream cheese is melted and the sauce is smooth. Whisk in the milk and the garlic powder. Once the sauce is heated through, add the parmesan cheese. Mix in the spinach and artichoke heart. Cover and let simmer until spinach has wilted, stirring occasionally. Season mixture with the hot sauce, red pepper flakes, and salt and pepper. 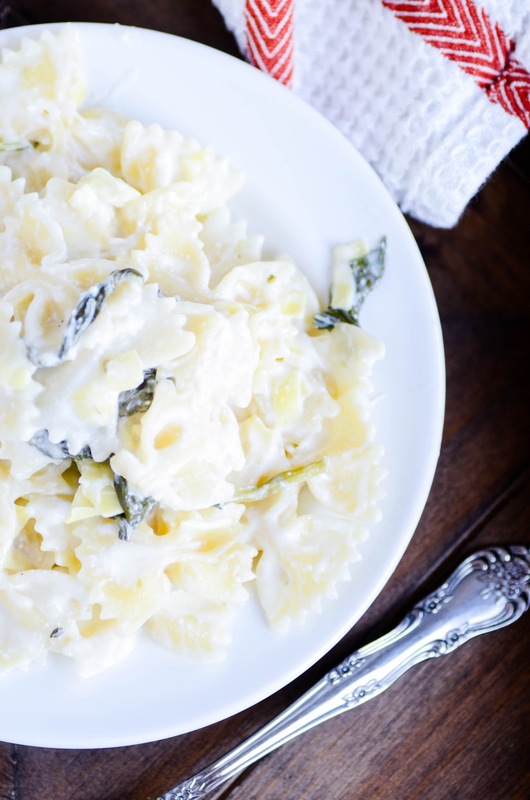 Stir in the bowtie pasta and serve topped with additional parmesan cheese.